This collaborative professional learning experience will build your capacity as a Teaching Artist to prepare you for the many different components of the school system—from unpacking pedagogy, to understanding curriculum, to gaining awareness about school culture and more. For this learning series, ArtStarts has partnered with IndigenEYEZ, a creative facilitation organization with a focus on strengthening four essential relationships—with self, with others, with nature and with culture—through an Indigenous lens. This event will be facilitated by Kelly Terbasket from IndigenEYEZ and Elfred Matining from ArtStarts. Learn how to develop quality arts-based experiences in a school environment that link your art practice, the BC Ministry of Education's revised curriculum and the First Peoples Principles of Learning. Build your capacity by developing a deeper understanding of creative processes and identify areas and opportunities to grow your professional art practice through arts-based learning. Learn how to foster culturally safe learning environments that transform the intersections of education and decolonization through the perspectives of art. Learn about resources for artists, such as the Artists in the Classroom grant available through ArtStarts, and have the confidence and skills to pursue these and other opportunities. Explore the language of education and build knowledge around contemporary Indigenous issues in schools in a useful and practical way that you can apply to your professional work. Strengthen your network of Indigenous artists in BC through peer learning and support. Introducing the 2017 Arts Integration Learning Lab: Indigenous Artists cohort. 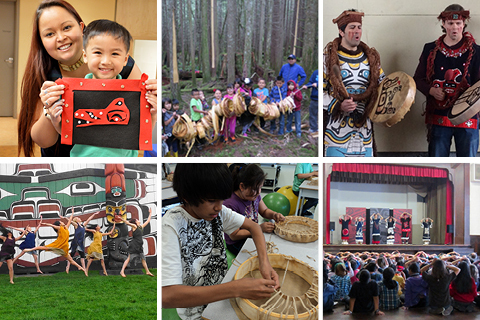 The Arts Integration Learning Lab will take place within the traditional territories of three local First Nations: the Musqueam, Squamish and Tsleil-Waututh nations in the city of Vancouver, BC. Artists living outside of Metro Vancouver Regional District, but within BC, are eligible to apply for travel and accommodation grants. A limited number of grants are available to successful applicants, distributed by lottery.